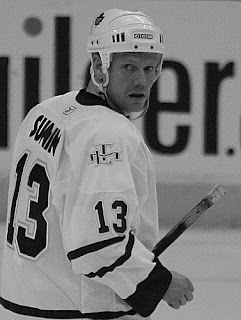 I am sitting here taking in the Toronto-Ottawa game (winning 2-1 right now) and watching Mats Sundin control the puck while defenceman desperately try to take it from him. The guy is a friggin' horse and I don't envy opposing defences who are trying to take the puck off of him. I just saw him break down the wing and he was really moving--Joe Corvo couldn't stop him and was forced to haul him down, thus another penalty for the Sens. He is really just a fantastic player and if he does leave Toronto this season, I will definitely miss him. He plays like a kid, not a 36 (soon to be 37) year old and is still, along with Tomas Kaberle, the best player on the Leafs. Posted by The Renegade Librarian at 5:06 p.m. He needs to be traded to Vancouver asap lol. We could use anther old guy that would help lead the team. I am really not sure he will leave the Leafs hmm I guess we will have to wait to see.